Puhoi Cosy Cottage is a 100 year old cottage. It's romantic and quaint. Pete and Deb live on site but far enough away to NOT DISTURB, but are available if a request is made. You will have free range eggs, bacon, hash browns and tomatoes in the fridge for your first breakfast. A full kitchen is available including antique crockery. A pot belly stove with wood supplied is available for keeping you warm in the winter months. The outdoor bath is private and has a brazier, which is soooo romantic. The historic Puhoi Pub is 5 minutes walk as is the local General Store, which make a great coffee and serves fish and chips. A short drive to several beaches make it a top spot for the summer - including Orewa, Sullivans Bay, Wenderholm and Waiwera. Orewa has many cafe and restaurant options all being only 10 minutes drive.We are only 15 minutes drive to an indoor snow skiing complex and Albany Mega Centre is 20 minutes drive. The famous Puhoi Cheese factory is close by and offers a lovely cafe with playground for children and a pond with ducks. Puhoi Kayaks will take you down the Puhoi River (tidal dependant) or you can just sit and relax on the deck of the cottage. Views from the deck looking down to the village and the old church. Can be hired at Puhoi Kayaks - 2 mins away. Couldn’t have enjoyed it more! All the little touches made for a perfect stay! Loved the outdoor bath complete with bath salts! Breakfast was fab. The cottage is certainly the result of a labour of love. Thanks Debbie and Peter! 21st century luxury in a cottage first built in 1915. Extraordinary views from the deck. Comfortable accommodation and immaculate bathroom. Delicious breakfast ingredients available in the fridge. We highly recommend it! So pleased you enjoyed The Cottage. We take pride in the condition our guests find the cottage and appreciate that you left it likewise. We would love to have you return. Such a beautiful experience from start to finish. We had the most magical time! To be able to spend our wedding night in this majestic setting is hard to put into words! Lovely hosts who made us feel so welcome and no rush to check out early! We would recommend this place to everyone! It was such a pleasure to share our little gem with you. 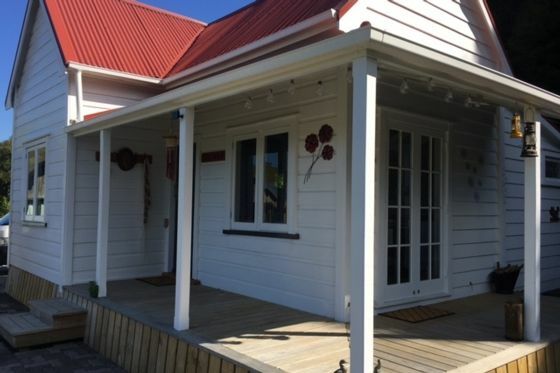 Puhoi and our Cottage are both "magical", we so agree. Thanks so much for leaving the Cottage so clean and tidy. And thanks, also for your great recommendation. Please come again. Really beautiful and peaceful and an easy drive north of the city. It was perfect being in the cottage for us, to avoid the New Years crowds. Superb facilities and very comfortable. Puhoi is an idylic little hamlet and so close to the main highway. Highly recommended for couples. It's great for those who don't want to travel too far out of the city. Happy to have you and appreciate your review. Especially the eggs and bacon! Our little hens are gems and keep us in good supply of fresh eggs for our guests. Please come again. We loved our stay in this quaint, beautifully restored, Puhoi gem! Overlooking the Puhoi valley it boasts a stunning view, and receives plenty of sunshine during the day. It exceeded our expectations. The fire warmed up the cottage well in the evening, and we loved the outdoor bath which is lit by fairy lights - bliss!! I so appreciated all the finer details to the cottage; the brass fittings, restored floors, the decorations, the calming colour palette. Beautifully done!! Debbie was a brilliant host! Everything you need is provided in the house. Delicious breakfast provided in the fridge. Very clean!! Very private and left to our ourselves. We had one night at the cottage, a precious 24 hours child free, and left feeling so well rested. Highly recommend this delightful getaway so close to the city. Thanks so much for a lovely review. We are so glad you felt so well rested. Our intention for the cottage is just that. Appreciate you leaving our little gem so neat and tidy.